(Seohyun Shim/ The Tufts Daily) Jumbo Hannah Isenhart, '20, runs on the filed during the game against Trinity College on Sunday, Sept. 17, 2017. After a 1–0 defeat on Senior Day and Homecoming to the Middlebury Panthers (9–2–1), Tufts recovered to record victories at the Hamilton Continentals (6–4–2) and the Endicott Gulls (7–4–1) this past week to move to 6–2–3 overall and 4–1–2 in NESCAC play. On a dark Wednesday night, Tufts faced off against Endicott at Hempstead Stadium, just a short journey away from the Medford/Somerville area. The Jumbos take every out-of-conference contest seriously, and their game against the Gulls was no exception. They stepped onto the turf knowing that this would be yet another opportunity to make a statement and to demonstrate their cohesive team play. Going into the game, the Jumbos came out of the locker room ready to battle. They craved a victory and a more respectable performance which was driven by their discontent with a negative outcome the past Saturday against Middlebury. After reflecting on what happened against the Panthers and moving forward to hone in on areas for improvement, the Jumbos embarked on a little bit of a revenge rally. They focused on one major emphasis point: capitalizing on plays to secure possession. Wednesday night’s 3–1 victory went down in the books as their highest-scoring game since last year’s 4–0 win over Endicott. Two of the Jumbos’ three goals came courtesy of first-year forward Elizabeth Reed. Just two minutes into the game, Reed led a promising drive down the field and past an Endicott defender. Spying a good look at the goal, she launched a powerful shot at the cage. The ball hit the crossbar and spun into the net to put the Jumbos on the scoreboard early. Endicott tried to respond immediately, with two shots by junior midfielder Mary Veneris on the 10th and 11th minute saved by Tufts’ junior goalkeeper Emily Bowers. Veneris eventually restored Endicott to level terms after converting a penalty kick in the 27th minute. Tufts created a number of other scoring opportunities throughout the night. Minutes before Veneris’ equalizer, junior co-captain midfielder Emma Ranalli tried to double Tufts’ lead, but her shot was put over the bar by a swift save from Endicott senior goalkeeper Shelby Elwell. Verneris had another shot on goal just before half time, but it sailed just wide. The Jumbos turned on the burners in the second half, putting two past Elwell. The first goal came eight minutes into the second period, when first-year midfielder/forward Sophie Lloyd converted off an assist from junior defender/forward Alessandra Sadler. Ten minutes later, Reed took advantage of Elwell’s unfavorable positioning to put the ball into an open goal and seal the result for the brown and blue. For the remaining portion of the game, Tufts relentlessly defended their 3–1 lead. In the 83rd minute, Tufts’ high foul count culminated in a yellow card for sophomore midfielder Ashley Latona. Aside from that minor setback, Tufts was able to hold onto its lead until the final whistle. Just three days prior — and the day after the Middlebury defeat — Tufts silenced Hamilton 2–0. According to junior defender Jamie Corley, the Jumbos’ ability to recover against the Continentals demonstrated the mental fortitude and strong team spirit of the team. A huge component to the Jumbos’ success was the number of corner kicks they earned, a sizable 11 compared to the Continentals’ five. Grubman scored the first goal off of senior midfielder Chandler Quintin’s corner kick, redirecting the ball into the goal to give Tufts an early 11th minute lead. Tufts was the stronger team in the first half, taking 11 shots on goal in the first 45 minutes as compared to Hamilton’s two. The Jumbos recorded a lead-building second goal just before halftime when first-year midfielder Hannah Isenhart found senior midfielder Margaret Zahrah, who tucked one in near the left post at the end of the half. Though the Continentals threatened in the second half, they could not get past Bowers. 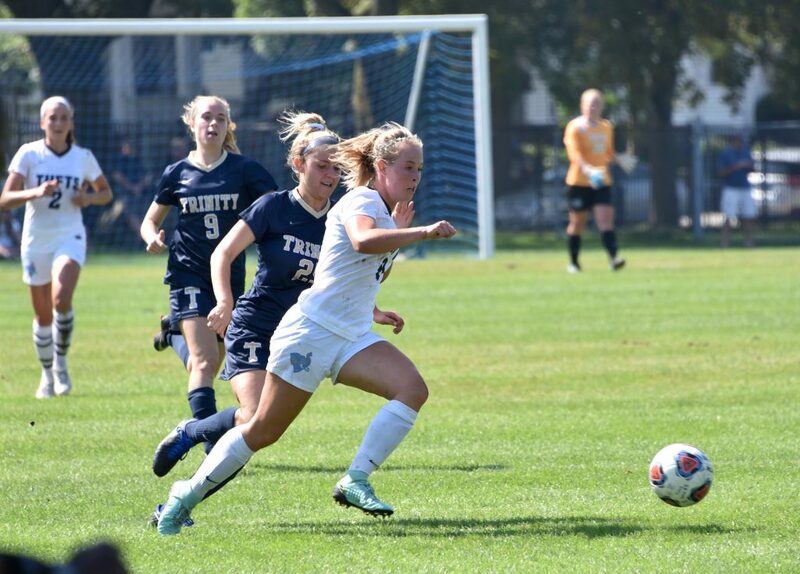 Just a day before, Tufts struggled against Middlebury in a high-pressure contest and, ultimately, Middlebury ended up capitalizing on its dominance — the visitors led in terms of shots (14–7) and corner kicks (5–1) — by converting an opportunity with just under 13 minutes left on the game clock. The team travels to Bates (6–4–1) on Saturday, Oct. 14 for a noontime kickoff, before hosting Lesley (9–2–2) on Tuesday.